For a long time the curling event at the 1924 Games was considered a demonstration event. It was not until 2006 that the IOC decided that curling was officially part of the program and retroactively awarded medals to the 1924 curling teams. Curling was also a demonstration sport at the Winter Games of 1932, 1988 and 1992. Curling was next officially on the Olympic program in 1998, and has been since. Therefore, curling has been an official part of the Olympics for the following years: 1924, 1998, 2002, 2006, 2010 and 2014. There are three medal events: a men's and women's event, and mixed doubles. 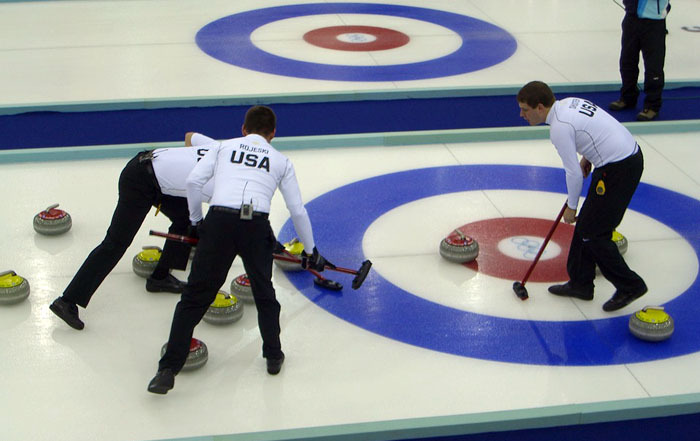 A mixed doubles event was approved for inclusion in the 2018 Winter Olympics following an IOC Executive Board meeting in June 2015. Curling (also known as Kurling in Europe, and sometimes referred to curling as 'chess on ice'), is a technical sport played by two teams or four players on a rectangular sheet ice with large heavy, polished granite stones. The teams take turns sliding the stones down the ice towards the target. Two sweepers with brooms also accompany each stone to help direct them. The aim is to get the stone to stop in 'the house', a target at the end of the ice track. Basically, the team with the most points in the match wins, with a point awarded for every stone closer than the other team's best effort. Canada created history in Sochi 2014 when it became the first nation to win both men's and women's Curling events in the same Olympics. Wheelchair curling is an event at the Winter Paralympics.